. - Bianco Smooth Leather Braided Crossbody Organizer This versatile vintage-inspired organizer from Patricia Nash can be worn as a crossbody bag or wristlet clutch. 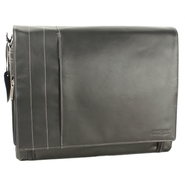 A smooth leather with multiple compartments and an organizer flap tucked inside makes it perfect for on the go. Girls We Hated In High School Handbags b - y Jeffrey Campbell King Bag in Fuschia Black Jagua Pony hair mini backpack featuring drawstring closure buckled snap-flap and three exterior pockets. Kate Spade - kate spade new york Nicola Flap Mini Crossbody Two halves of a heart adorn the bold gold-tone spade of a kate spade new york shoulder bag with a surprise pink lining.
. - Leather Minuet Flap Handbag The Minuet flap bag will be talked about wherever it goes! 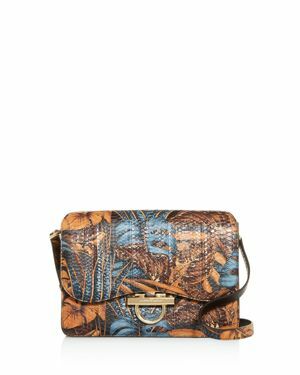 Made of smooth leather and adorned with a Signature closure its ideal size will complement your look from day to night. 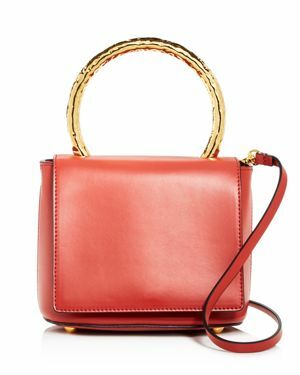 Rebecca Minkoff - Vanity Crossbody Bag in Burnt Orange Grommet-trimmed pebbled leather cross-body bag featuring magnetic-snap closure at front flap. Detachable shoulder strap. Measures approximately 12&quot;H x 13&quot;L x 4.5&quot;D with a 21&quot; strap drop.